Child abuse can result in parricide, the killing of one's mother or father. Such is the case of a 13-year-old who is charged with killing her 34-year-old father. She used a shotgun, allegedly after suffering years of sexual abuse by him. The teen is on record saying she couldn't take the abuse any longer. Investigators report that the girl lived in a home that was rife with domestic violence, a home which the local District Attorney described as "filthy". Toilets were clogged and overflowing, most of the furniture was in a grave state of disrepair, and the teen herself was forced to sleep on a couch that most would heave into a dumpster. My Comments: Children who are sexually abused blame themselves for the abuse, and they believe they have the power to stop the abuse. They are filled with rage, shame and guilt. The rage is multiplied when legitimate reports of abuse are made and determined to be either unsubstantiated or even worse, unfounded. Children who resort to killing a parent are often victims of long-standing emotional, physical and/or sexual abuse. They suffer from extreme feelings of abandonment, not just from their parents, but also from the child protection system because they have tried to get help for themselves to no avail. They believe there isn't any help for them, and consequently, resort to taking matter into their own hands with the use of deadly force. Deadly force is an act of desperation, an act that reinforces the belief that only the child can stop the abuse. We can educate children. We can teach them that child abuse in any of its forms is not their fault. 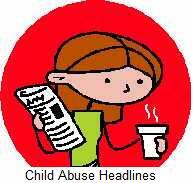 We can give the children resources to contact if they are being abused. But if we don't also educate the social workers in Child Protection Services, abused children will continue to slip through the cracks. If there is any hope of truly helping abused children, case workers must understand the "red flags" of abuse and they must be given the means to protect these children. Failure to provide these resources will result in an escalation of desperate acts, and subsequently, we will be dealing with more and more incidents of parricide. Add your comments on the form below.